Each coupler is engraved with the Item #, serial number, and key specifications for easy identification. When the white port on the left is used as the input, the coupling ratios listed below correspond to the ratio of the measured output power from the white (signal output) port to the red (tap output) port. The connector key is aligned to the slow axis of the fiber. These 1x2 Polarization-Maintaining (PM) Fiber Couplers are designed for operation at 670 nm and are available with a 50:50, 75:25, 90:10, or 99:1 coupling ratio. 1x2 couplers have only one input port for simplified use and cable management. These couplers are ideal for applications where light is split from the input port into two output ports at the specified coupling ratio; unlike WDMs, they are generally not recommended for beam combining applications. The unused port is internally terminated within the coupler housing in a manner that minimizes back reflections (please see the 1x2 Coupler Tutorial tab for details). PM couplers are manufactured using PANDA fiber which allows them to maintain a high polarization extinction ratio (PER) when light is launched along the slow axis of the fiber. As seen in the diagram to the right, stress rods run parallel to the fiber's core and apply stress that creates birefringence in the fiber's core, allowing polarization-maintaining operation. Typical applications for PM couplers include optical sensors, optical amplifiers, and fiber gyroscopes. Thorlabs' PM Couplers provide a high PER (≥16 dB including connectors) and a wide -40 °C to 85 °C operating range. Note that the PER will vary with temperature; see the Temperature Cycling Tests section in the PER Measurement tab for details. They have a maximum power handling of 300 mW with connectors or bare fiber and a maximum power handling of 500 mW when spliced (see the Damage Threshold tab for more details). These couplers undergo extensive testing and verification of the PER; details of our testing procedures are provided on the PER Measurement tab. Testing results are included with a data sheet that is shipped with couplers. A sample data sheet for the 670 nm PM couplers can be viewed here. These couplers are available with 2.0 mm narrow key FC/PC or FC/APC connectors, as outlined in the tables below. Fiber leads are jacketed in Ø900 µm Hytrel® tubing and the leads are 0.8 m long. Custom coupler configurations with other wavelengths, fiber types, coupling ratios, alignment axes, or port configurations are also available. Please contact Tech Support with inquiries. This tab provides a brief explanation of how we determine several key specifications for our 1x2 couplers. 1x2 couplers are manufactured using the same process as our 2x2 fiber optic couplers, except the second input port is internally terminated using a proprietary method that minimizes back reflections. For combining light of different wavelengths, Thorlabs offers a line of single mode wavelength division multiplexers (WDMs). The ports on our 1x2 couplers are configured as shown in the schematic below. Pport1 is the input power at port 1 and Pport2+Pport3 is the total output power from Ports 2 and 3. All powers are expressed in mW. where Pmax is the maximum power able to be transmitted through the coupler when scanning across all possible polarization states. Pmin is the minimum transmission across those same states. where Pport1 and Pport1b are the optical powers (in mW) in port 1 and the internally terminated fiber, respectively. This output is the result of back reflection at the junction of the legs of the coupler and represents a loss in the total light output at ports 2 and 3. For a 50:50 coupler, the directivity is equal to the optical return loss (ORL). Insertion loss inherently includes both coupling (e.g., light transferred to the other output leg) and excess loss (e.g., light lost from the coupler) effects. The maximum allowed insertion loss for each output, signal and tap, are both specified. Because the insertion loss in each output is correlated to light coupled to the other output, no coupler will ever have the maximum insertion loss in both outputs simultaneously. A graphical representation of the coupling ratio calculation. Insertion loss (in dB) is the ratio of the input power to the output power from each leg of the coupler as a function of wavelength. It captures both the coupling ratio and the excess loss. The coupling ratio is calculated from the measured insertion loss. Coupling ratio (in %) is the ratio of the optical power from each output port (ports 2 and 3) to the sum of the total power of both output ports as a function of wavelength. Path A represents light traveling from port 1 to port 2 while Path B represents light traveling from port 1 to port 3. It is not impacted by spectral features such as the water absorption region because both output legs are affected equally. A graphical representation of the Uniformity calculation. The uniformity is also calculated from the measured insertion loss. Uniformity is the variation (in dB) of the insertion loss over the bandwidth. It is a measure of how evenly the insertion loss is distributed over the spectral range. The uniformity of Path A is the difference between the value of highest insertion loss and the solid red insertion loss curve (in the Insertion Plot above). The uniformity of Path B is the difference between the solid blue insertion loss curve and the value of lowest insertion loss. Item list does not include the posts, post holders, clamps, breadboard, or fiber component tray shown in the photo to the left. This previous-generation FiberPort is no longer available. A suitable replacement is the PAF2P-11C FiberPort. The polarization extinction ratio (PER) is a measure of how well a polarization-maintaining (PM) fiber or device can prevent cross coupling between the different polarization axes of the fiber. External stress on a fiber from sources such as heating, bending, or pulling can cause the PER to change. There are two accepted techniques for measuring PER in a fiber coupler. The most common method uses a low-coherence (unpolarized or circularly polarized) broadband light source and measures the extinction ratio with a linear polarizer and power meter. An alternative method uses a narrowband, high-coherence light source and measures the PER with a polarimeter. Thorlabs uses the power meter method to characterize the extinction ratio performance of the premium PM fiber couplers sold on this page. An example of the power meter setup is shown in the image and table to the right. 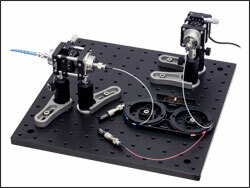 A broadband light source is input into the linear polarizer module, which sets the polarization of light input into the coupler. The output from one of the legs is sent to the analyzer module, which contains another polarizer and the power meter for measuring the output. Alternatively, the analyzer module can be replaced with an extinction ratio meter (Item # ERM100). The PER is measured using the test procedure below. Prepare the fiber end faces of the PM coupler to connect to the measurement setup. For bare fiber ends, strip and cleave the fibers. Use a bare fiber terminator, such as the BFT1, to create a temporary fiber termination. For terminated fiber ends, clean and inspect the connector end faces. Attach a fiber optic light trap to any fiber leads not being measured. Adjust the polarizers in the linear polarizer and analyzer modules sequentially until a minimum power value is measured by the power meter. Record the measured value as Pmin. Rotate the analyzer rotation mount by 90°. Then record the measured value as Pmax. PER measured using the white-white path and white-red path through a PN1550R5A1 PM coupler. PM couplers typically exhibit diminished PER performance when used at sub-zero temperatures due to the contraction of the adhesives that are used in the coupler package. This effect disrupts the polarization state of light within the coupler that leads to a decrease in PER. Soft adhesives can be used to mitigate the impact of cold-temperature operation, but can create reliability issues at higher temperatures. 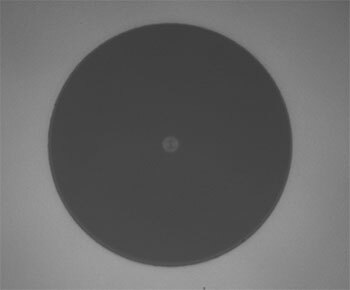 At high temperatures, adhesives can soften permanently, which changes the optical properties of the coupler. Thorlabs' Premium PM Couplers use a proprietary packaging process and design as well as careful selection of adhesives to enable operation over a very wide temperature range (from -40 °C to 85 °C) without significant changes to PER and other optical specifications. The graph to the right illustrates a 7-hour temperature cycling test performed on a PN1550R5A1 PM fiber coupler showing that the PER remains stable over a wide temperature range. Measured at the center wavelength. Specified at room temperature, without connectors, and with a slow axis launch through the white input port. Measured at 635 nm. Specified at room temperature, with connectors, and with a slow axis launch through the white input port. See the PER Measurement tab for more information on how extinction ratio is measured. These couplers can be used with patch cables that incorporate PM630-HP fiber (click for FC/PC and FC/APC versions). Couplers with other fiber may be available upon request. Please contact Tech Support with inquiries. The connector keys are aligned to the slow axis of the fiber.